Heat grill pan or gas or charcoal grill. Place pineapple slices on grill over high heat. Cook uncovered 4 to 8 minutes, turning once, until light brown. Coarsely chop pineapple; set aside. Cook rice as directed on package, using coconut water as liquid and adding salt. Let stand 5 minutes or until flavors are blended. 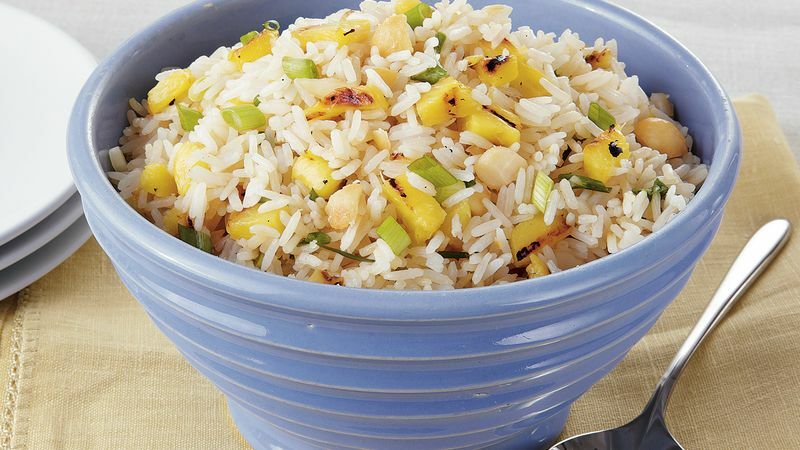 Fluff rice with fork; stir in grilled pineapple, nuts and onions. Full of good-for-you electrolytes, coconut water adds a subtle tropical flair to this easy side dish.